Okay y’all…first of all…these breakfast tacos are AMAZING. 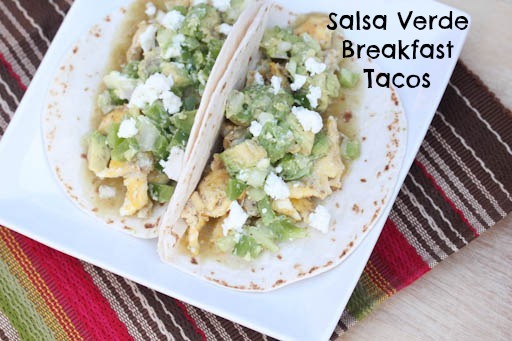 My husband, who has become quite the “taste tester” over the years, went on and on and on and on about these being the best breakfast tacos. BUT…this meal wasn’t without incident. After dinner, I noticed that Tyler had developed a rash on his chin and by the time bedtime rolled around (not long after dinner! ), the rash was also on his elbow and hands…in the same places that he reacts if he accidentally get milk/dairy. I’ve suspected an egg allergy with him, as he has had very small reactions to foods in the past that I didn’t always pin to eggs. Plus he never wants to eat scrambled eggs when I make them for breakfast, or when his brothers make them during the week before school. Tyler didn’t want any of the “green stuff” on his eggs, so he just had the eggs, apple slices and tortillas…so my money is on the eggs being the problem! Finally, I’m adding this meal to my Fast Five Meals board on Pinterest…because it can be on the table in 15 minutes or less! FTW! 1 avocado, seeded and diced ($.33) Check out this week’s Sprouts ad! 1 green pepper, seeded and diced ($.50) From last week’s Sprouts sales! 1/2 cup salsa verde ($.25) Amazing BOGO find at HEB this week, 2 big jars for $1.77! Cut the green pepper and avocado. While the eggs are cooking, mix together the diced avocado, green pepper with the garlic powder, ground cumin a little salt and pepper and some goat cheese or queso cojito or sour cream. To assemble, spoon some of the green salsa in a line onto each tortilla. 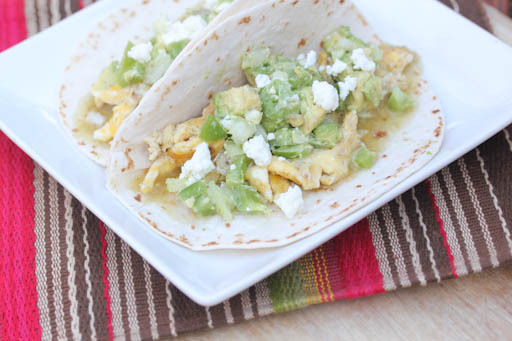 Top with the scrambled eggs, then the green pepper-avocado mixture. Add more goat cheese, queso cojito or sour cream, roll up and serve. How much of the cumin and garlic powder goes in the eggs and how much goes in the green pepper/avocado mixture?